In 2016, Jean Courtney recorded a series of special podcasts of interviews with participants from the 2016 International Student Voice Seminar in Vermont. Following are these interviews, including a bio, the interview and related links for each one. See the bottom of this page for more info about the event. Special 1: Dr. Dana Mitra and Kaden Litzinger, a student at Delta High School in Pennsylvania. Dr. Mitra is with Penn State University, and author of several books related to student voice. Special 2: Rainbow Chen, a student at Winooski High School and a member of the Vermont Board of Education. Special 4: Dr. Bill Preble, founder the Center for School Climate and Learning, author and more. Special 5: Andrew Brennen, the National Field Director for Student Voice. Special 6: Katie Morgan and Gina Fiorile, staff at The Wild Center in Tupper Lake, New York. Special 7: Naima Raza, founder of the Bluewater Sustainability Initiative and a student trustee for the Lambton Kent District School Board in Ontario. Special 8: Greg Williamson, a longtime student voice advocate in Washington State government and beyond. Special 9: Dr. Marc Brasof, faculty member at Arcadia University and author of several books related to student voice. 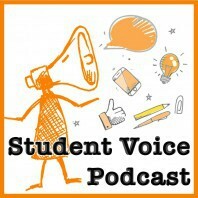 This is a special series of Student Voice Podcasts with interviews by Jean Courtney of participants of the 2016 International Seminar: Amplifying Student Voice and Partnership, hosted by the University of Vermont (UVM) under the leadership of Dr. Dana Mitra of Pennsylvania State University, Dr. Helen Beattie of Up for Learning, and Dr. Penny Bishop of UVM. This series features young people, youth policy advocates, educational researchers, field-based practitioners of student voice, and educational leaders talking about student voice and partnership efforts and how to get started. I have to admit something: for all of my life, I have tried to make a living following my passion. My experience in the fields of human motivation and civic engagement have shown me I’m not alone, and that there’s an emerging economy of passion. Here I reflect on my experience, and share some of the markers of this new economy. When I was 14 years old, I realized that youth empowerment enlivened my soul. Over the next decade, I worked with in a dozen nonprofits striving to empower young people through mentoring, teaching, facilitating and supporting communities, families, schools and other places where children and youth spent all their time. I did this work in many roles: tutor, mentor, ropes challenge course facilitator, adult living skills teacher, naturalist, youth center director… Sometimes I volunteered; oftentimes I got paid. Immediately after 9/11, I decided I wanted to teach others how to make a living following their passions, too. Reflecting on the struggles my family faced while I was growing up and watching the horrific events of that fateful day unfold on TV, I immediately decided that life is too fleeting, too restrictive and too short to do work that doesn’t reward the soul. Up until that point, I met and was inspired by a lot of people following their dreams, making a difference, and living as fully and wholly as they wanted. Reflecting on those people and examining my own experiences, I found a series of patterns emerge and recalled powerful lessons. Absorbing research and literature on passion, engagement and empowerment, I found some vital points I wanted to teach. In the 15 years since, I’ve worked to help people live their passions. I’ve spoke at more than 100 conferences worldwide and facilitated many workshops with countless young people and adults. All of them have shown me one thing: An economy of passion is emerging that is changing the world right now. I believe an economy of passion is emerging around the world. With more access to more knowledge than ever before, more people are cultivating the skills, habits and beliefs they need to live their dreams. This isn’t exclusive to wealthy white people in the Western hemisphere, either; instead, communities of color and the Global South are leading the way. Maybe that’s because they’ve never left this economy. My experience and studies have shown me there are five major markers of this emerging economy of passion: Jobs of Passion; Population Sustainability; Nodes of Passion; Intergenerational Equity; and Obvious Interdependence. Jobs of Passion—In order to establish an economy, there has to be an exchange of goods and services for value. Jobs of passion allow people to follow their dreams, empower their interests, and engage their networks. There are no limits on what is a “job of passion” either: A gas station attendant can be equally passionate about their work as a visual artist. What matters are individuals’ self-perception of their work, and how they feel about their jobs. In the emerging economy of passion, people will have jobs they are excited, interested and fulfilled by. Population Sustainability—Economies of Passion can work because of the longevity of interactions; the healthy relationship between production and consumption; and the ongoing interest of individuals within it. These factors sustain populations where people are passionate about what they do, why they do it and what difference it can make. When an Economy of Passion has population sustainability, it can feed upon itself, grow its boundaries and engage people more effectively. Nodes of Passion—Practical, purposeful places where individuals can connect, engage and empower each other are key to Economies of Passion. Whether happening in workplaces, community centers, schools, or someone’s garage, nodes of passion engage like-minded people with common passions in collective action that can benefit groups and individuals. Beyond that, there are no parameters for nodes of passion. They can be online spaces or happening in realtime; they can be singularly focused or represent a multiplicity of interests. Intergenerational Equity—Young people and adults are gradually moving beyond historically negative, belittling relationships by establishing thoughtful, mutually respectful and empowering partnerships that benefit everyone involved. Economies of Passion require this intergenerational equity in order to engage, sustain and expand on positive things happening right now in communities. Intergenerational equity allows children, youth, young adults, adults and seniors to establish foundations for healthy, positive and empowering passions throughout an individual’s lifetime while providing sustained engagement for all members of a community. Obvious Interdependence—While people are increasingly understanding the interdependent nature of society, many don’t understand that our emerging Economies of Passion completely necessitate interdependence. Because of this, it becomes startlingly obvious throughout all facets of these economies, including each marker mentioned above. Jobs of passion require interdependence in order to exist and sustain; Population sustainability relies on interdependence, particularly as transparency and mutuality are made apparent; Nodes of passion require all hands on deck as individual own the collective good, and; since Intergenerational equity cannot happen in a vacuum can’t exist without attentiveness towards relationships, it is essential for younger and older people to rectify the imbalance of their interactions today. These are the major markers of the emerging economy of passion for many reasons, not the least of which being that they are the most repeating factors I’ve discovered through my work. Other markers include Environmental Well-Being; Accessible Passion-Based Education; Apparent Culture; and Expansive Opportunities. In November 2014, I sat calmly with some friends in the São Paulo Museum of Modern Art in Brazil. Invited there to speak at an education conference, my hostess took me to a beautiful park to share her community’s emerging Economy of Passion. It was there in the museum that she shared with me the power of The Tree School. Located in the southern Bahia state of Brazil, this dynamic learning space was created by two local nonprofits, one working in Brazil and the other in Palestine. In each community, young people, adults and seniors were provided space to learn with each other. They were given access to tools and knowledge, provided with time and space, and granted explicit permission to follow their hearts and dreams. As I sat in the São Paulo Museum of Modern Art, I was a member of a circle of Brazilian students who generously translated the conversation to English for my sake. They told me about the baobab tree whose rootball was suspended above the circle and is pictured above. It was a metaphor for the inherent connection between nations where Africans were enslaved for the benefit of Europeans, and the baobab trees that grew where those slaves were originally from. Everyone involved was knowledgeable, committed and felt strongly about the ways they relied on each other for their creativity, well-being and sustainability. As The Tree School and my professional experience have taught me, the emerging Economy of Passion will provide opportunities for everyone to establish sustainable connections to their hearts and minds, and to share those connections with the people around them and beyond them. Everyone can access the Economy of Passion, and increasingly, more people are whether they know it or not. As we establish more access to more interesting things that grip our hearts and minds, many of us are enlivening parts of ourselves that were rocked to sleep by today’s consumerist economy. Too many people have become too reliant on other people doing things for them and doing things to them, and we have allowed ourselves to become more passive and less passionate everyday. We don’t have to live that way. Instead, we can activate our personal passions by identifying what matters to us most, naming that out loud, and giving ourselves the time and space we need to activate, captivate and motivate our own attention. By doing this, we can become active masters of our lives who nurture and infuse the emerging Economy of Passion. If you’re interested in becoming an active player in the future, embrace the markers I’ve outlined here and work to acknowledge the emerging Economy of Passion in your community. No matter who we are, where we are or what we’ve done, we all have passionate possibilities for the future. The Economy of Passion will embrace your passionate possibilities as soon as you become engaged. Can your future wait? Adam Fletcher is a writer, speaker and trainer who teaches people to engage people as the leader of CommonAction Consulting. He is the director of both The Freechild Project and SoundOut, too. Learn more about him by visiting adamfletcher.net.